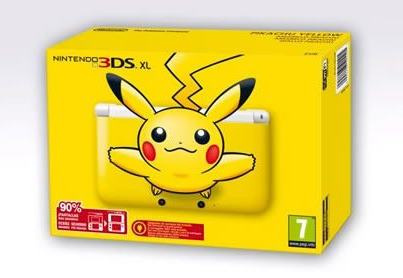 Last week, Nintendo of Europe president Satoru Shibata confirmed that the Pikachu 3DS XL would be coming to Europe later this year. Today UK retailer GAME has tweeted to its followers that the charming yellow handheld is now available for pre-order, with a price tag of £179.99. A release date for the device is yet to be confirmed. To guarantee one, make sure you head over to GAME's website now. If anyone's thinking of pre-ordering one, let us know in the comment section below. It's available on french amazon since the beginning of the week for 200€ and due to december 5th. Let me know when it comes to the States. I hope I can preorder one in the Netherlands or Belgium. Otherwise I'll have to buy a UK one online. @Collinhall Yeah, on his NECK. Anyway, I might just get it if it comes to the US when I have money. If only it featured Magikarp.. ...I still think it's ugly. @BenAV Same here. I'd rather have the pink and white 3DS XL here in the states. Getting this for christmas to replace my aqua blue one. Not because of the color, but my current one is all banged up (me being stupid, flinging around my 3DS game case didn't realize it was open) It flew in the air and landed on concrete. Huge crack on the left of the top screen, circle slider popped out a little bit, and the D-pad is loose. Can't wait though. This will be awesome, although I wasn't a fan of the DSi XL I guess I can give this a try. Bigger screen is actually cool. This reminds me of the Pikachu N64. One of my friends really wants this! This is great for him, and could be for me if I had the money! This is the first I'm hearing of the Pikachu 3DS XL but I kind of wish they took opportunities like this to do packaged deals like they did at points with the DSi and DSi XL later in their lifetime. @MyBodyIsReady : That would be EPIC. People like Pikachu that much? Ew (to Pikachu, not the people). I'm not even a Pokemon Fan but I want! Does anyone know if theres big difference between North American 3DS compared to a European 3DS?